USA, 1971. Director: David E. Durston. Bhaskar, Jack Damon, Lynn Lowry, Jadine Wong, George Patterson, Rhonda Fultz, Arlene Farber, Tyde Kierney, Alex Mann. 83 Mins. Watch the I DRINK YOUR BLOOD trailer! After consuming rabies-infected meat pies, an LSD-crazed hippie cult goes on a vicious murdering rampage! Heavily censored since its original release, the infamous landmark of cinematic brutality is being presented for the VERY FIRST TIME in America in all its blood-spattered glory. Grindhouse Releasing’s acclaimed special edition DVD is the only authorized release of the uncut I DRINK YOUR BLOOD, featuring long-lost scenes restored with the participation of director David E. Durston. Coming soon to Blu-ray! 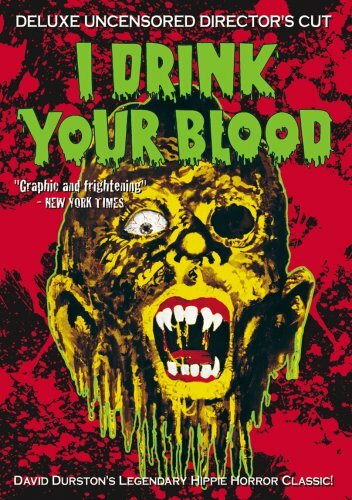 I Drink Your Blood definitely needs blu-ray treatment. Grind house Releasing has a great print in order to do so. Hope it happens soon. I’d like to see a deluxe expanded bluray as well. I can’t watch my Uncle carve the Thanksgiving turkey with the electric knife without thinking about that one scene. I even brought this film over to watch for a group drinking who don’t typically watch these kinds of films(My Mistake I learned 10 minutes in…. ) However they stuck it out and once the revenge plot kicked in, oh man were they on board. This film gets crazy enough that when the audience is paying attention, they are hooked and it delivers. It’s even better with a crowd going wild watching it.